This stainless steel jockey box coil features a square shape for a snugger fit in your cooler, legs to allow chilled water to get underneath, and 120-foot length. Pour your draft beer more efficiently than ever with this 120-foot jockey box coil. This 120-foot long jockey box coil includes hex nuts, ferrules, and rubber grommets on each side for connection to your cooler coupling in the back and beer shank in the front. The 120-foot length offers a large amount of surface area for rapid, efficient cooling of your beer, making this a great option for events with high-volume dispensing. In 3/8" and 1/4" outside diameter, these coils are the right size for the majority of larger jockey box kits. Set up your jockey box no more than 10 feet from your ice cold keg. Attach the beer line from the top of the keg coupler to the cooler coupling, and the air line from the outlet barb on the CO2 regulator to other side of the coupler. Adjust the keg regulator to 40-60 PSI based on your setup. Keep both the jockey box coils and keg cold throughout to avoid foaming (no more than 40° F). Please note: this product listing includes the square 120' coil and fittings only. Check out our entire line of jockey boxes for full kits, build-your-own kits, and more! Coil O.D. : 3/8" - 1/4"
Ferrule for Jockey Box Compression Fitting - 1/4"
Well manufactured and easy to install. Square coil installed in my Igloo cooler. Ready for tailgating this weekend. I'm extremely grateful to Kegworks for all their help in getting my jockey box up and running. Everything worked without a hitch. BEST ANSWER: This coil weighs 13 pounds. Will 2 of these fit in a 48 qt Coleman cooler? What is the weight for the 120ft coil? Is the benefit of the square coil over round simply how it fits in cooler and that's it? 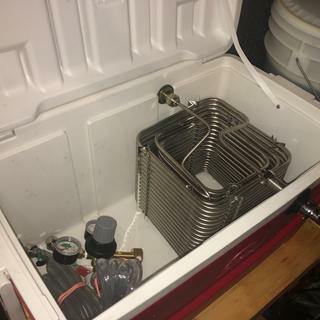 BEST ANSWER: Hi Jeff, in addition to a better fit, the square coil also has spacer legs which elevate the coil and slightly separates each coil which allows the cold water to chill from underneath to keep your beer colder. Cheers! I am planning to use an artic (Yeti) cooler with thicker walls and am not sure a 4" shank will be long enough. Do you offer any longer shanks that I could use with this coil? BEST ANSWER: Thank you for your question. While I can't speak specifically to the Artic cooler that you mentioned, we use a 4" jockey box shank on our 65 and 75 Yeti Jockey Boxes and they fit without issue. Hope that helps! Cheers! What hardware would I need to connect the coil to the shank from the product as sold? BEST ANSWER: Hi Kevin, Here are the parts and quantities needed. These coils are only compatible with our 4" Shanks (#1334CF-5) and 4" Cooler Couplings (#219AW-4). The resistance for this coil is 25.2lbs.